Our dentist working in Route 14 Dentistry will place in the dental bridge (non-removable) when the patient is missing one or more teeth next to each other. Call us here at Crystal Lake Illinois to book a visit or to discuss your smile needs. Dr. Moon is eager to support you with them. When you have missing teeth that sit together a bridge is recommended to restore the natural look and your smile. The bridge is custom made for you so it fits perfectly. It is not removable and is held in place by using crowns on either bridge side, on two of your own real teeth. This ensures the bridge stays in placed and does not loosen at all. Such a procedure will need two visits with our dentist. It will last a long time though, helping you feel a lot better once more about the appeal of your smile, and its function and health. 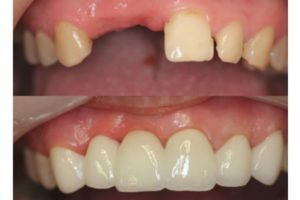 To help you with your decision we can talk about dental bridges and other options to help you take pride in your smile once more. Please come visit or give us a call.